ATSR-Report Abstract Central Kalimantan covers an area of 153,564 km² which is 28% of the total area of Kalimantan. The southern part of the province consists of lowlands and wetlands (mostly peatland), constituting a total of 36,716 km² or 24% of the total extent of the province. This area comprises 812 km² of coastal plains, 12392 km² of alluvial plains (including floodplains), 1,027 km² of tidal swamps, and 22,485 km² of peat swamps (RePPProT, 1885). The middle and northern belts of the land vary from low-altitude uplands to rolling hills with a height of up to 2,500 m (the Schwaner and Muller Mountains at the northern boundary). According to a 1995 statistics (Biro Pusat Statistik, 1996), Central Kalimantan has a total population of 1,627,000 and a population density of 11 per km² - very little compared to an average density of 101 per km² for the total of Indonesia. Up to the beginning of this decade it had huge pristine and (secondary) logged peatland areas which are changing quickly. Droughts, forest fires and famine were logical results. 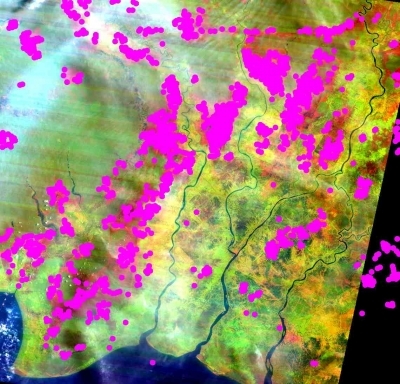 In 1997, Central Kalimantan was one of three main regions in Indonesia where forests and peatlands were on fire. The "Mega-Rice-Project" was a major location of "hot spots" because burning for land clearance had been started at the onset of the dry season. In June 1997, months before fires and smog had become a serious health hazard to millions of people in South-east Asia, the areas upstream of the reclamation project already suffered serious food shortages. A marked drop in the water-level of major rivers, combined with poor visibility due to smog hindered food transport, and lack of water for irrigation made the planting of crops impossible. By September/October 1997, famines were reported in the entire area.